The seven-layer honey cake known as medutis. When Vaidas Sukys first opened Mama Papa Lithuania (1241 Park St.) in 2013, I wrote about how the quaint little restaurant in Alameda was the only Lithuanian restaurant on the entire West Coast — the only place I knew of in the Bay Area where a potato dumpling lover could throw back a couple of Svyturys lagers and munch on dark rye bread imported from a village in Lithuania. Now, Sukys is once again on the cutting edge of the Bay Area’s Eastern European food scene: About a month ago, he opened Mama Papa Lithuania Bakery (1239 Park St.) — apparently the only full-fledged Lithuanian bakery on the West Coast — in a space formerly occupied by a barber shop, right next door to the restaurant. Oh, you didn’t know Lithuanian baked goods were a thing? Sukys is more than happy to give a primer on the large selection of cakes and pastries that Danute Sukiene — the bakery’s namesake “mama” and, not coincidentally, Sukys’s real-life mother — cranks out each day. 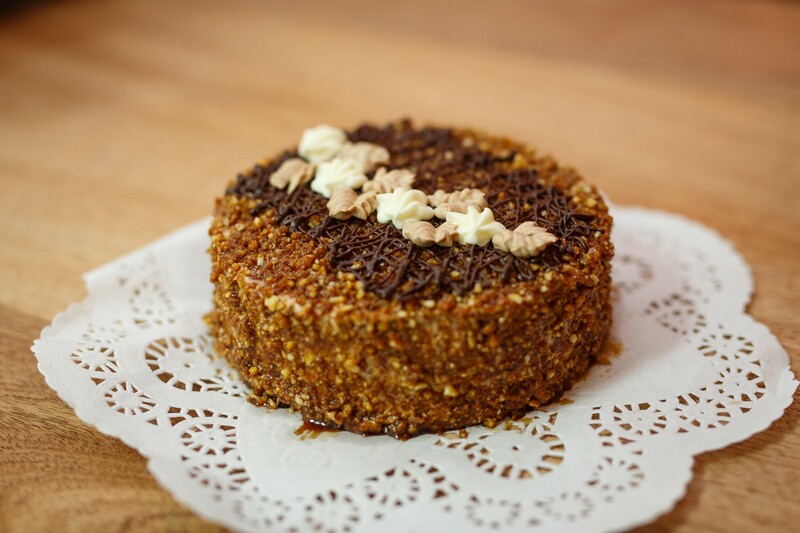 The showstopper is a dessert that longtime patrons of the Mama Papa Lithuania restaurant know very well: the delicate, seven-layer honey cake known as medutis, which combines cake infused with the smoky sweetness of roasted honey with a tangy sour cream filling. As of Monday, the Mama Papa website boasted that 24,528 slices of the cake had been sold since the restaurant opened. But at the bakery, you can buy a whole cake — gorgeously decorated, and big enough to serve four to six — for a modest $20. (Larger sizes are also available.) I might just have to order one the next time my birthday rolls around. But Mama Papa Lithuania Bakery sells all kinds of Old World treats you won’t find at any other bakery in the area — from recipes Sukiene mastered when she ran a bakery back in Lithuania. According to Sukys, the confection that catches the most eyes is something called a Boletus Mushroom, named after the mushroom species (aka the porcini) it bears a striking resemblance to — so much so, Sukys said, that customers often ask if it’s a real mushroom. These are big, iPhone 6-sized cookies made with honey dough, with “caps” that are coated with chocolate and “stems” coated with meringue. In Lithuania, these are a traditional festival treat. “Kids would walk around, and instead of lollipops, they ate mushrooms,” Sukys said. 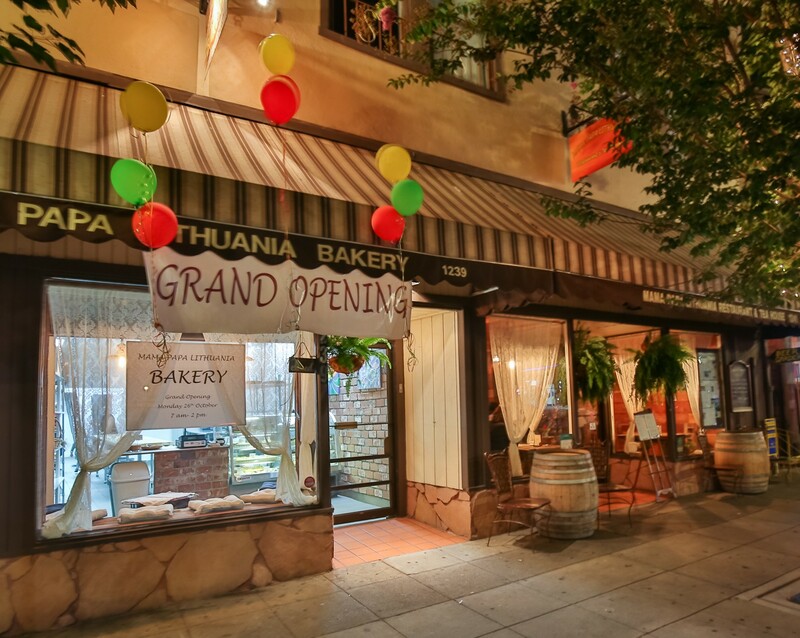 The only Lithuanian bakery on the West Coast opened in Alameda about a month ago. Meanwhile, Christmas is apparently a big deal in Lithuania, and perhaps you’re wondering if the only Lithuanian bakery in town is doing anything special for the holidays. You’re in luck: Starting this week, Sukys said, the bakery will sell the Christmas biscuits known as kučiukai for about $3 a container. Each of these little pastries is about the size of an olive and is only lightly sweetened and flavored mainly with poppy seeds. Because consumption of dairy products is forbidden during Kūčios, the traditional Lithuanian Christmas Eve dinner, the kučiukai are typically served floating in a kind of soup or “milk” made by soaking crushed poppy seeds. You’ll have to make the poppy milk yourself. But for all your other Lithuanian pastry needs, all you need to do is head over to Alameda.